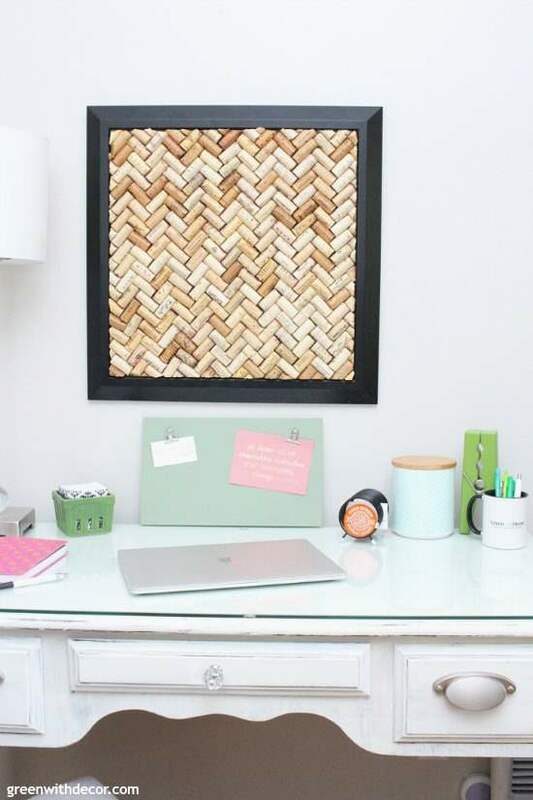 Making a DIY cork bulletin board is even easier after you know these little tricks! I’ve mentioned before that Kalen is a fabulous gift giver. He always thinks of something that person really wants or needs. I’d been tossing around ideas for the blank wall above my painted desk so of course, he came up with a great idea: a DIY cork bulletin board. I was all in. Plus he handled most of the project himself, which makes it even better. He even figured out a few secrets that are helpful for pretty much any cork project you do going forward, so I knew I had to share them with you guys! I can’t believe I didn’t know a few of these things before. 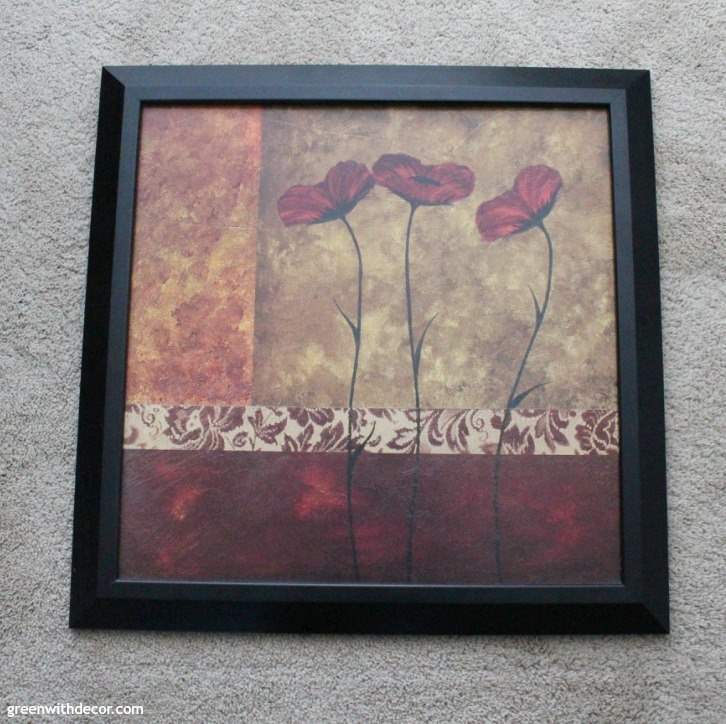 I didn’t paint our frame, because I like how the corks pop against the black. But if you are going to paint, do it before you line up all the corks inside. It will be way easier than worrying about getting paint on any corks. 2. Line up your corks inside the frame. Figure out what pattern you want to do. Then start in a corner and work your way out. Keep in mind two things: one, you’re not actually attaching the corks to the back of the frame yet, just using the frame as a border for your pattern, and two, this will end up being the back side of the corks (more on that in step 3). Fill in all of the whole corks, then cut corks to size to fit in all of the spaces around the edges. Don’t pick up the corks to get the glue in between, just apply the glue over the intersections of each cork. Remember, you’re working with the back of your corks, so don’t worry about any glue showing. There will be PLENTY of glue showing, but you’re going to flip the entire thing over once it’s all glued together so it doesn’t matter. I don’t know why I’ve never done cork projects like this before. I was always worried about getting the glue exactly in between the corks so you couldn’t see it instead of just laying them all flat and applying the glue on one side (the back side) like this. So much smarter and faster! Be sure to apply glue on every intersection so that the corks are all held together tightly. Let the glue dry for a few hours. 4. Flip the cork piece over so it’s outside of the frame. I’ve done a lot of cork projects (I have them all linked at the bottom of this post if you’re interested), and I’d never used this topcoat before. It is a game changer and so easy! I’m going to go back and apply it to a few of the cork projects from years past just to give them extra protection. Hold the can about 8-10 inches from your cork piece and spray across the corks in rows, making sure you hit each cork. It will look a bit ‘wet’ as soon as you finish. Let it dry for a few days so the smell goes away. Here’s another little secret: We started to use rubber cement but quickly realized we had too much area to cover and not enough time to place the corks down before the rubber cement was drying in some areas, even with both of us working on it. 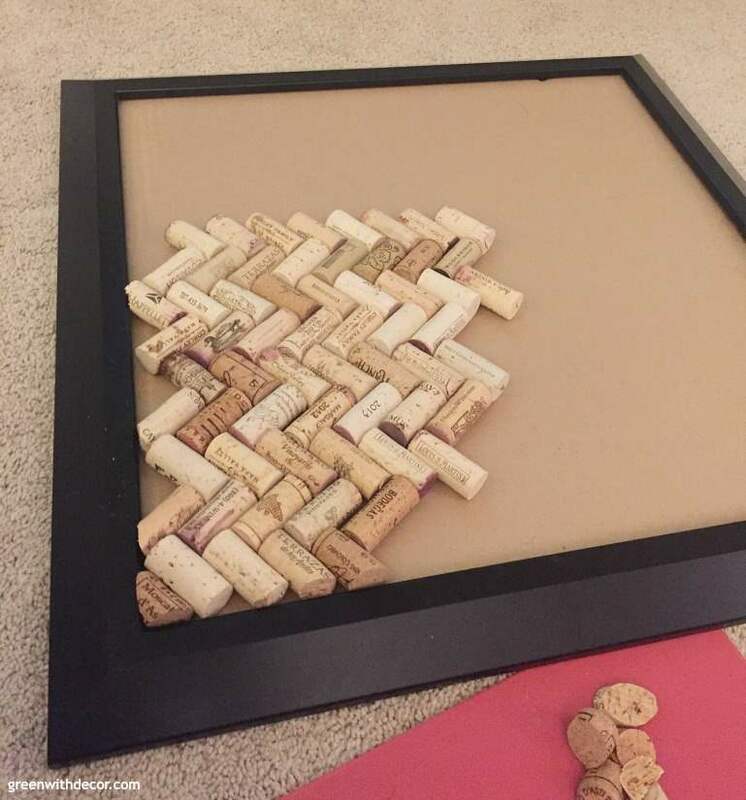 So instead, put the cork piece back into the frame, holding it with one hand while you flip the frame on its side to hammer nails into the back of the frame to secure the corks to the back of the frame. 7. Attach a sawtooth hanger (if your frame doesn’t already have one) and hang it up. Here’s a close-up of the corks. Oh, and I finally got new business cards after getting my logo redesigned a few months ago. Just in time for a conference I’m at this week. It’s much better having something pretty and functional over my desk instead of looking at a blank wall. And with that, I think we can officially call this ‘desk nook’ done! It feels good to check off another room.